Transformation Goddess is actively seeking individuals who are looking for new ways to provide high quality, content rich products and services to their audience, to become our affiliate partners. You fill out the simple registration form. Upon your registration as a TG Affiliate you will receive access to our affiliate management center where you will find your unique affiliate URL link and a several Ad Banners and creative copy points to help you promote our products. Each time a potential client clicks on your unique affiliate link and purchases one of our affiliate eligible Products, you will receive up to 50% of the sales price even if they don’t purchase the Product immediately. The innovative, state-of-the-art tracking system that the TG affiliate system keeps track of your referrals for one full year. As an affiliate you will have access at all times to your affiliate account and can see the ‘clicks’, your sales and your commission. Payments are paid monthly by Paypal when your earned commissions equal $50 for the previous month’s sales. Please see our Terms of Service for Full Payment Details. 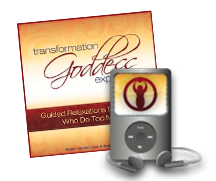 Who can be a Transformation Goddess Affiliate? Anyone can become a TG affiliate as long as they are willing to comply with the TG Affiliate Program Terms of Service. However, we actively seek like minded businesses and individuals who are looking for new ways to provide high quality, content rich products and services to their audience, to become our affiliate partners. As with any online promotions you are only permitted to recommend the TG products in legal ways, and never, ever use “spam” as a method of sharing our Products or Services. As you know, spam is not only annoying and invasive, it’s illegal! We do not allow the placement or promotion of our Products on any site contain pornographic or offensive content. Please read our Terms of Service for full detail on our Affiliate program. What TG Products can I Share? The new TG Affiliate Program currently offers commissions on a limited number of Programs and Services, please visit our Affiliate Promotions Hub to view our active promotions. As new products, programs and services are added, the affiliate center will be updated and affiliates will be notified via email about the new promotional opportunities. TG Affiliates are paid monthly for the prior month’s sales, as long as you’ve acquired at least $50 in commissions. You will need a PayPal account in order to receive your commissions and funds will be transferred into your PayPal account. As an affiliate you will have log-in access to check your sales and commissions at any time you desire. I’m Ready to Begin… What’s Next? It’s quick and easy! Click on the image below and you’ll be taken to the TG Affiliate Center, just click Sign Up Button and follow the instructions to join. After you have registered for our affiliate program you will then receive simple, clear step-by-step instructions, graphics and text to begin earning a passive income. Thank you for partnering with us in our mission to support women to step into their divine feminine power.